As the fashion industry seeks new solutions to preserve our ecosystem, how can we also draw inspiration from science and natural processes to create innovative, experimental and sustainable materials? Synthetic biology explores how we can re-design biological processes to fulfill new purposes – including waste-free bio-leathers as alternatives to animal leather. 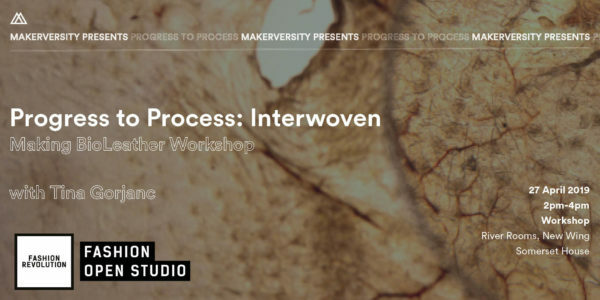 Join speculative designer Tina Gorjanc to explore what this means for the future of fashion – and learn how to create your own bio-leathers using accessible, natural ingredients. No design/science experience needed – only curiosity! Bring your own fabric or textured material to learn, play, experiment and mould new DIY fabrics! Tina Gorjanc is a Slovenian critical and speculative scenario designer who is recognized for her work that merges the practices of fashion and textile design with biotechnological procedures. Tina graduated from the course in 2012 and her graduation project granted her the A’ Silver Design Award in the Fashion, Textile and Garment category, consequently placing her as the 10th world’s leading designer to watch for in 2017/2018 in the same category. This programme is part of Earth Day 2019 season at Somerset House and Fashion Open Showcase part of Fashion Revolution Week.